The subject of a New York Times best-selling biography and a Pulitzer-Prize winning musical, interest in Alexander Hamilton is at an all-time high. 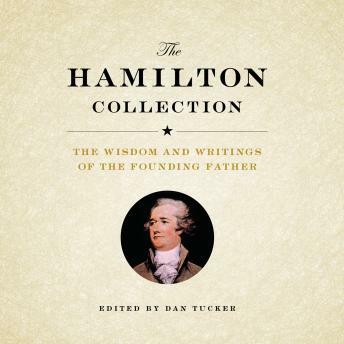 This carefully curated collection of Hamilton's writings gives the listener an intimate glimpse into the mind of our most misunderstood founding father. The smash-hit musical Hamilton presents its central character as a truth-telling immigrant boot-strapper who used his extraordinary intelligence to make good--but what was he really like? Let the man himself, a prolific and extremely effective writer, tell his story in his own words. States' financial system, and established friendly trade relations with Britain. The book includes love letters to Elizabeth Schuyler, who became his wife, and correspondence with his friend-turned-nemesis, Aaron Burr, which led to the duel in Weehawken that ended Hamilton's life at the age of 47. Also included are responses from some of his correspondents that give a 360-degree view of the man so esteemed by his protector and friend, George Washington, but reviled by others, including Washington's successor as president, John Adams. Illustrated with 50 illustrations, drawings, document facsimiles and more, the text is accompanied throughout by explanatory annotations from editor Dan Tucker who also provides introductions to each chapter and a preface.